2017 was an incredible year. 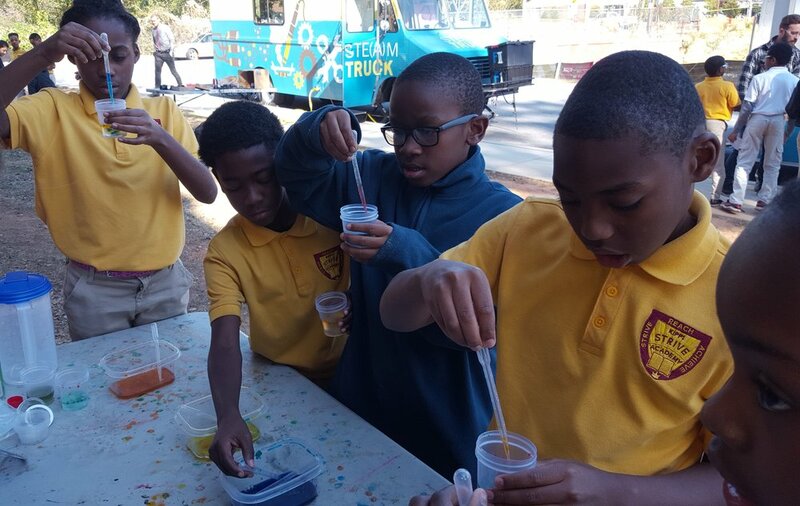 This year we plan on DOUBLING the number of students we see, increasing the effectiveness of our programming, and ensuring all of our students leave STE(A)M Truck loving learning. Curious to see the impact we've made over the years? Download STE(A)M Rises, our 2015-2017 Impact Report here! Community Guilds Inc. is an Atlanta based non-profit committed to closing inequities and catalyzing transformation. Our hugely innovative, results-producing, award-winning program, STE(A)M Truck has been out on the road since 2013. 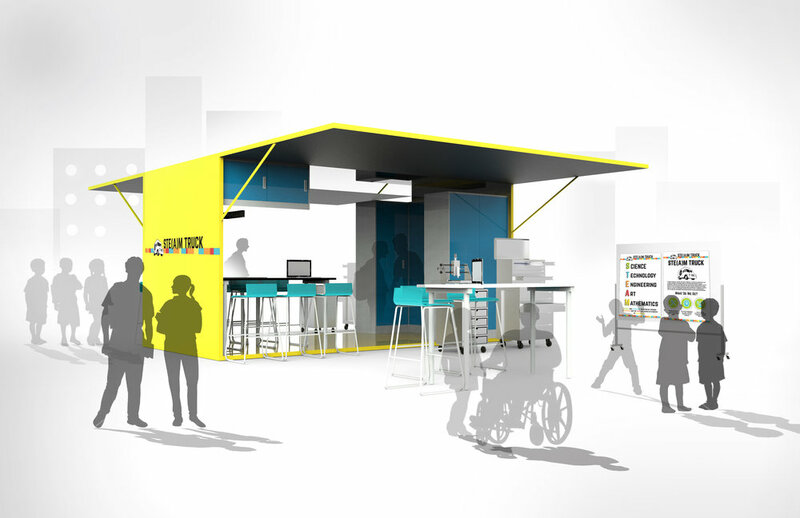 But every community needs a place where you can tinker, build and learn from experts. Every neighborhood needs their own Community Guild. Imagine if we could harness the collective expertise of an entire community to teach youth. What you are imagining is a Community Guild. According to the 2015 NAEP (considered the Nation's Report Card), after 13 years of public schooling, less than 40% of students are ready for college and career success. The research is clear. Access to hands-on building, tinkering, and the kinds of curriculum we offer can increase access to STEM careers and build the skills critical for long term success. However, the tools, expertise, and time needed to utilize these types of strategies are usually unavailable in public schools, and especially so in public schools serving low income communities. Our mission is to close opportunity gaps and provide lifelong opportunities by transforming teaching and learning through an experiential maker approach that brings together youth and adult learners within collaborative communities. Our vision is that through formal and informal educational experiences, K-12 youth throughout the U.S. will have equitable access to transformative and inspiring learning experiences that open doors for future life opportunities. c) lack of informal education opportunities for children in poverty is a predictor of the achievement gap. With our innovative and groundbreaking STE(A)M Truck model, we can provide ongoing technical support, professional development and guidance. We align our Builds with a teacher's curriculum and ensure our work still shapes the classroom long after we drive away. And a Community Guild offers a place where educators can come together outside of school to colloboarte, ideate and build additional skills. 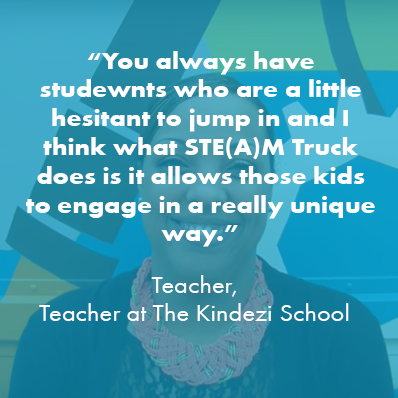 STE(A)M Truck is a platform that allows the broader community to directly, and authentically, work with teachers and students. But once we drive away, teachers, students and the local community need a place to continue to tinker and build. We envision our first Community Guild to be a place where the broader community can come and learn. How is it going so far? Based on assessment prior to and following a variety of engagements, we've seen some exciting results! Over the next five years, Community Guilds is committed to strengthening and deepening its impact, while driving to greater scale and sustainability, in two main ways. First, Community Guilds will continue to refine its STE(A)M Truck and student engagement model, both by codifying and standardizing certain elements and by piloting variations to others. Second, Community Guilds will work to deepen its support to the broader community by building and launching place based Guilds. Community Guilds has set ambitious yet achievable plans to grow its reach while preserving its high bar for quality and maintaining a low cost for the programming. Community Guilds is seeking local partners to build our first Guild and a place based community makerspace. Since its founding, STE(A)M Truck has been honored with a number of awards for its creative initiatives and innovative curriculum. We're proud to be acknowledged for our hard work. Click here to check out our awards. Below are partners, funders, and supporters have made our impact possible. Sign up with your email address to receive news and updates about Community Guilds.